Following the horrendously massive extinction at the end of the Permian period, methane levels in the atmosphere fluctuated widely from the expected normal levels of around 2,200 parts per million. The fluctuations occurred between 278 million and 250 million years ago of roughly 5 major peaks with the first one being the biggest reaching around 4,400 parts per million. During these exceptionally high methane peaks and subsequent global warming conditions, the interior of the great supercontinent appeared more desert-like because conditions on land were hot and dry. Only the coastal regions remained sufficiently humid to support ground-covering ferns, tall tree-like ferns such as Dicroidium, conifers and cycads, and an increasingly more diversified and flourishing insect population. Then the methane peaks eventually became troughs as the conditions began to cool down a little and rainfall increased. Soon the plants edged their way once again towards the interior of the supercontinent until much of the land became a huge tropical forest, thereby stabilising the fluctuations in climate from the methane. In the same way the plants expanded across the continents, there was a similar expansion in animal numbers over the next few million years. Nothing unusual here, except what differed in this sudden burst (in geological terms) in life compared to the Cambrian period was the greater numbers of animals of a particular theme rather than an all out innovate stage of evolution. Among the land-based creatures that successfully evolved at this time included the first true hairy-like mammals and the first dinosaurs (the name comes from the two Greek words deinos, "terrible", and saurous, "lizard"). However, it would be the dinosaurs who would dominate life on the great supercontinent (known as Pangaea) for the next 170 million years. Evidence to support the existence of this great supercontinent can be seen from the fossil evidence. The fossils show animals of the Triassic Period were widespread and remarkably alike throughout all the continents of the world. But later, after the supercontinent broke up during the Jurassic Period at around 210 million years ago (and with further isolation of animal communities as the seas rose in the early Creataceous period), the animals diversified into more unique forms based on locality. 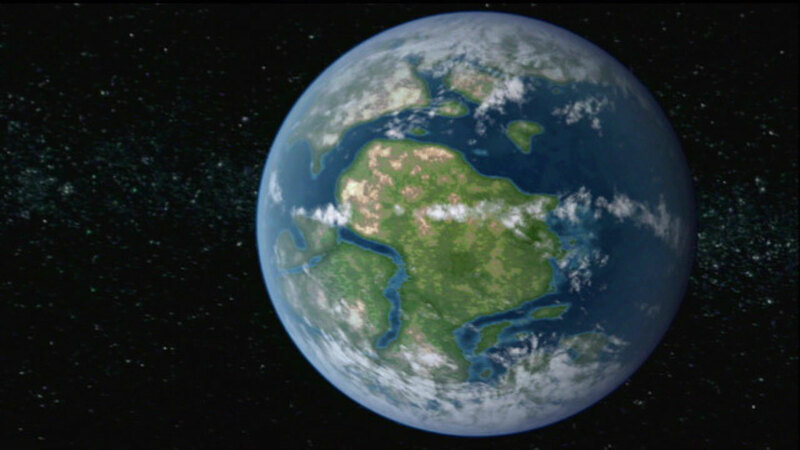 Earth in the Early Triassic era around 237 million years ago. Image © 1997 Christopher R. Scotese. As of 2014, an updated map can be downloaded from the Colorado Plateau Geosystems, Inc. web site and created by Professor Ronald C. Blakey of Northern Arizona University (NAU). The Sun is known to take approximately 225 million years to travel one revolution around the Milky Way. Thus nearly one revolution around the galaxy ago, the Earth was just starting to be dominated by the dinosaurs. The early dinosaurs were small creatures by our standards, but they later evolved into some of the largest land animals that ever lived. 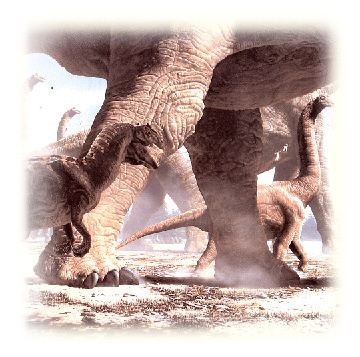 Part of the reason for these changes included a new hip structure in the predators allowing these animals to bring their legs closer together and lift the entire body with greater ease compared to those older animals whose legs came out the side and scuttled around. As a result, these predators could move more quickly. Indeed, some predators became so confident in their new hip structure that a few evolved the ability to run almost entirely on two legs with the remaining limbs becoming nothing more than mere stumps. For the plant-eating animals, they had no choice but to evolve to better survive the onslaught from these predators. This included the development of tough armour plating along the spine, neck and head region, turning large tails into lethal weapons, and simply to gain greater size to overwhelm the predators. During these evolutionary changes over the next 50 million years, huge plant-eating dinosaurs like the Apatosaurus (formerly called Brontosaurus), Briachiosaurus and Sauropods, and large terrifying meat-eaters such as the Tyrannosaurus Rex roamed the Earth. For nearly 100 million years, early mammals lived in the shadow of the great dinosaurs. Shown here is an artist impression of a Tyrannosaurus Rex chasing an ostrich-like creature called a Struthiomimus (centre). Hiding in the fern trees is a Megazostrodon (foreground). Source: Reader 1986, p.125. This was a time when size did matter. Not only was there a plentiful supply of food on the great supercontinent to support very large dinosaurs on land  a kind of giant "smosgasbord" of fresh meat and vegetation just sitting out there ready for the taking  but also there was a survival bonus: the larger the animal can become, the more easier it is for the animal to survive the attack of most predators. A meat-eating Allosaur tries to take one of the young dinosaurs from a herd of Sauropods, risking life and limb in doing so. Source: Norman 1991, p.93. Despite size being an important factor in the survival of many dinosaurs, they had one major weakness: the reptiles did not develop a quick and effective internal body temperature-regulator. Not a major issue for the dinosaurs as there would be an extremely persistent period of very warm, moist tropical-like climate existent throughout much of the world for at least the next 50 million years. 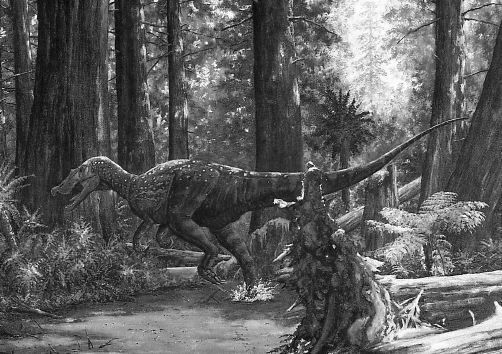 A Baryonyx searches the forest floor for fish and other animal prey. Source: Norman 1991, p.108. Mammals, on the other hand, did develop a primitive internal body temperature-regulator suggesting they were adapting to the lower temperatures existent at the extreme northern and southern latitudes on Earth, on mountain-tops, deep inside certain caves, or during the night where the great dinosaurs were probably more sluggish or kept themselves around lakes and shallow inland seas (which would have absorbed a lot of heat during the day), thereby allowing the mammals to remain hidden from view. Those mammals that did become nocturnal, remained small but their eyes and ears became more enlarged and sensitive to the darker environment. Land-based mammals of this era were almost certainly small creatures living secretly and did not evolve into larger more complex creatures until the great dinosaurs disappeared. NOTE 2: Mammals are not the only creatures to develop fur on their skins. Some smaller dinosaurs living in the temperate and polar regions also developed filaments of hair. These filaments became more abundant and colourful as a means of attracting a female partner. 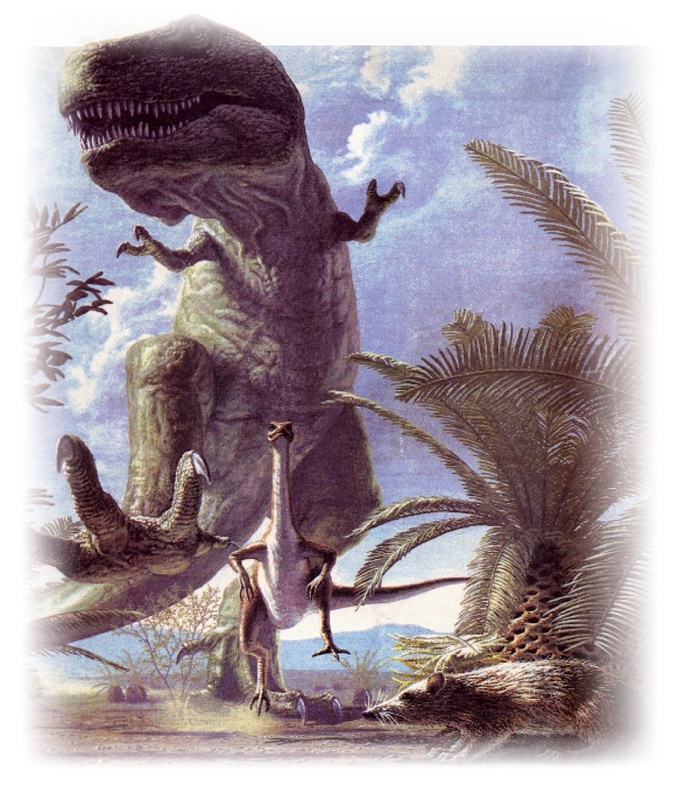 Eventually a point came when enough of these filaments allowed some lightweight dinosaurs to glide through the air, and later to use the heavily feathered front limbs to create enough force to push the animals through the air and achieve lift. We call these animals birds. Apart from the crocodiles and some other small reptiles, birds are the only dinosaur species to survive to this day. The great supercontinent began to split apart. 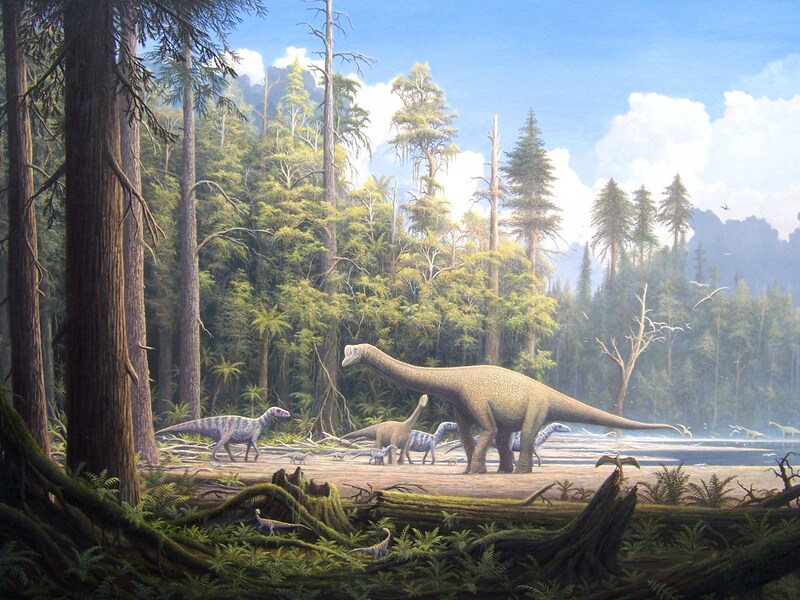 A classic and realistic forest scene with some dinosaurs near a lake. This was typical throughout the great supercontinent during the Triassic and Jurassic periods. 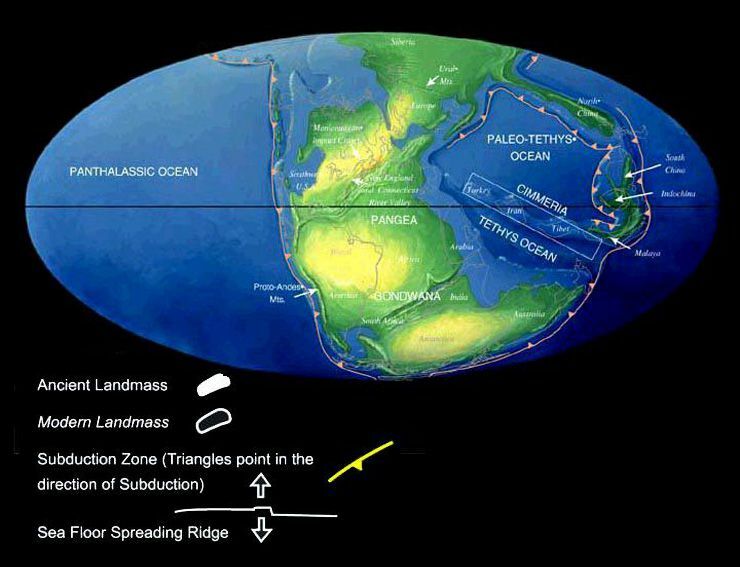 Earth in the Early Jurassic era around 195 million years ago. Image © 1997 Christopher R. Scotese. As of 2014, an updated map can be downloaded from the Colorado Plateau Geosystems, Inc. web site and created by Professor Ronald C. Blakey of Northern Arizona University (NAU). Also worth mentioning at this time is the work of a team of Chinese and American scientists who have discovered in the rich fossil beds of Yunnan province in China a 12mm long 195 million-year-old skull from a tiny animal no larger than a paper clip. What makes this prehistoric skull so remarkable is its bone structure. According to the scientists, this is the oldest known creature having the distinctive and crucial mammalian feature of having a one-boned jaw for better control of chewing and three middle-ear bones for improved hearing. Furthermore, the name given to this creature  Hadrocodium wui  means "full head" because of the skull's relatively large brain-holding capacity. Scientists believe a large brain did develop inside this skull because the animal utilised these distinctive anatomical features for its survival. Reconstruction of hadrocodium wui. Image © 2013 David Attenborough's Rise of Animals: Triumph of the Vertebrates (BBC and Atlantic Productions Ltd.). NOTE: Mammals with a womb to carry its offspring, as opposed to laying eggs in the environment or having a pouch to carry the offsprings, first appeared 165 million years ago. In the midst of the great dinosaur age at around 190 million years ago, the extraordinary abundance of plant life covering the great northern and southern supercontinents, as indicated by fossils dated to this period, gives evidence of a more moist and warmer climate than today. It was so warm that even polar ice caps may not have existed! If there was ever a good time to have global warming, this would be it. At least the plants would have provided adequate shade and retain enough moisture on the ground, while providing reasonable amounts of food to any animals that depended on them. 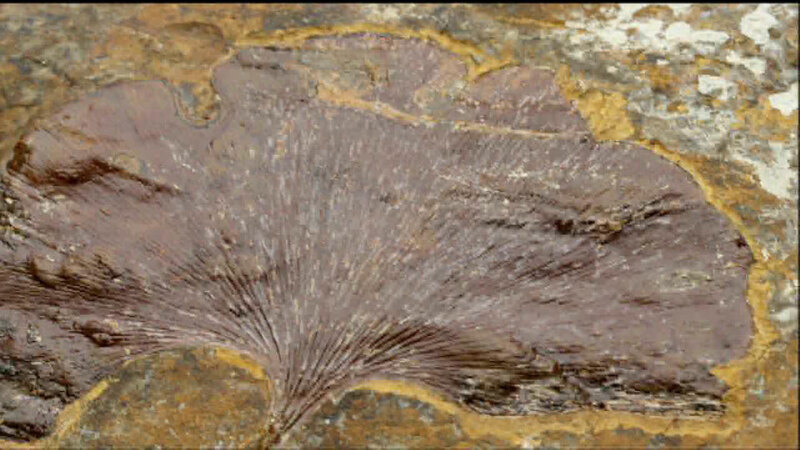 The leaf of a ginko (top) compared to a fossilised version (below). By counting the number of microscopic pores on the fossilised leaf where carbon dioxide is taken in, scientists have been able to calculate the amount of carbon dioxide in the atmosphere of 190 to 160 million years ago and thus accurately reconstruct the primeval Jurassic climate and forests. Basically the fewer the pores, the less carbon dioxide the plants require to grow which in turn shows a much higher concentration of carbon dioxide in the air. On examining the fossilised leaf, scientists noticed a much lower pore count than the ginko leaves grown naturally in today's climate. 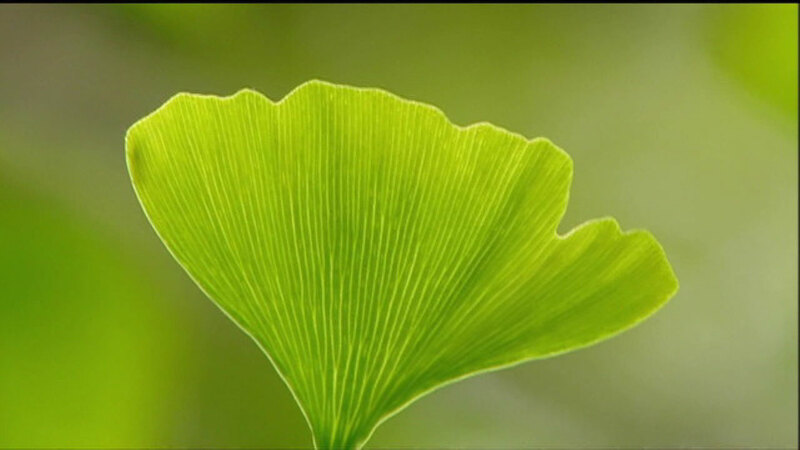 Through controlled experiments, scientists have been able to calculate the amount of carbon dioxide needed in the air to create a ginko plant of the equivalent number of pores as in the fossilised version. The concentrations of carbon dioxide at the time of the dinosaurs was calculated to be 4 to 5 times higher than at the start of the industrial revolution in the 1800s. Source: Smith, Dr Richard. Crude  The incredible journey of oil: Catalyst. 18 May 2007 (televised 24 May 2007). Scientists believe the origin of this super-greenhouse effect came from the great volcanoes dotted along major cracks in the Earth's crust caused by the breakup of the great supercontinent. Scientists say the great supercontinent of the south began to break-up and drift apart some 210 million years ago. This was the time when the mid-Atlantic ridge was born between 180 and 210 million years ago. By 160 million years ago, the air was laden with four to five times the carbon dioxide levels than existed just prior to the industrial revolution of the 1800s (or 2.5 times the quantity we see today due primarily to humans burning fossil fuels). The reason why the supercontinent had to break up around 210 million years ago is not precisely known. It is possible that another asteroid may have collided with the Earth (probably over water this time as there is no evidence to show there was a sudden reduction in worldwide temperatures for a brief moment which could have ended the great dinosaur age). Certainly it is known that another major and widespread extinction had occurred nearly 214 million years ago (8) coinciding at about the time of the great supercontinent breaking up. Or maybe it has to do with the way the strong internal heat currents in the magma of the Earth can break the crust into individual, free-moving tectonic plates. We can only speculate at the reason for the break-up of the great supercontinent. "We've reaching the wrong conclusion about the major controls on decomposition because of the way we've traditionally collected." Further details of this study can be found in Nature under the title "Climate fails to predict wood decomposition at regional scales", 1 June 2014, available from here. Artist impression of Earth nearly 160 million years ago. Clouds would have covered more of the planet at this time than shown here because of the supergreenhouse effect and the great plant life dominating the supercontinents. Source: Smith, Dr Richard. Crude  The incredible journey of oil: Catalyst. 18 May 2007 (televised 24 May 2007). Whatever contributed and maintained global warming for such a long time (probably starting with the Permian asteroid impact), scientists are certain the weather of 160 million years ago was generally uniform and differences between summer and winter were not apparent. Temperatures at the poles rarely dipped below 10 to 15°C (7); whereas the levels of rainfall were very high, giving rise to more lush and denser tropical plant life across the great supercontinents. In fact, these wet conditions on land were made possible because of extensive plant life covering the supercontinents which in turn retained more moisture on the ground and provided sufficient humidity in the air to fall as rain along certain mountain ranges. However, after the end of the Jurassic Period, nearly 136 million years ago, conditions began to get cooler. With fewer volcanoes and enough plant life absorbing carbon dioxide from the atmosphere together with some mountain-building and changes in the position of continents on the Earth's surface, as well as possible changes to the soil chemistry (e.g., less phosphorus to promote the growth of large plants) we see for the first time in more than 50 million years how the Earth began to form polar ice caps. But apparently, this cooling down effect would not last long, as we will see in the Cretaceous period. 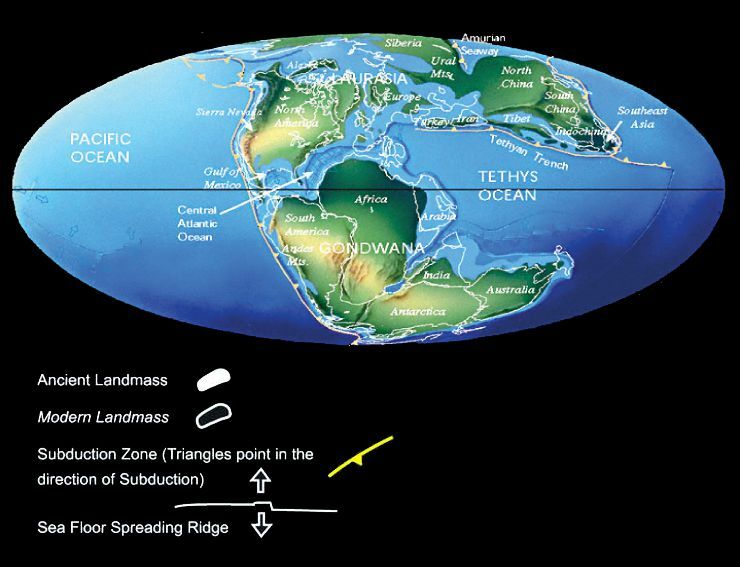 Earth in the Late Jurassic era around 152 million years ago. Image © 1997 Christopher R. Scotese. As of 2014, an updated map can be downloaded from the Colorado Plateau Geosystems, Inc. web site and created by Professor Ronald C. Blakey of Northern Arizona University (NAU). Contradicting the traditional view that mammals at this time were small rodents scampering through the undergrowth searching for food and hiding from the dinosaur predators and weren't adventurous enough to diversify into other forms, a team of researchers from the Chinese Academy of Geological Sciences in Beijing and Carnegie Museum of Natural History in Pittsburgh headed by Dr Qiang Ji of Nanjing University reported in the 24 February 2006 journal Science the fossilized remains of a 60cm long platypus and Beaver-like mammal living 164 million years ago. The well-preserved fossilized remains was found in 2004 in the inner Mongolian region of China known as Liaoning province. Aptly named Castorocauda lutrasimilis meaning "beaver tail" (castoro is latin for "beaver" and cauda for "tail") and "like a river otter" (lutra stands for "river otter" and similis meaning "similar") by the discoverers, this interesting cat-sized creature is believed to be the largest known mammal living in the Jurassic period. It possessed limbs claimed to be well-developed for aquatic life including soft-tissue webbing in the hind feet as purportedly seen in the fossil. In fact, preservation of some soft tissue and fur imprints must be seen as a testament to the quality of the find compared to other fossils dated to this period. Scientists suspect the animal swam in rivers and lakes like a platypus, and built nests in burrows along the shore. 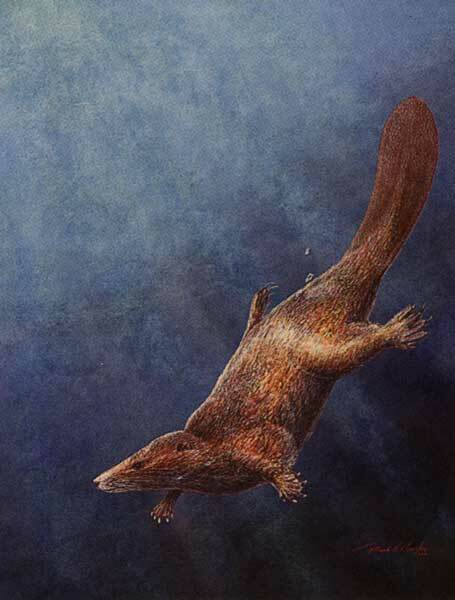 However its head looked more like a rodent with a broad scaly tail like a beaver, and its sharp teeth looked like an otter designed to eat fish and insects. 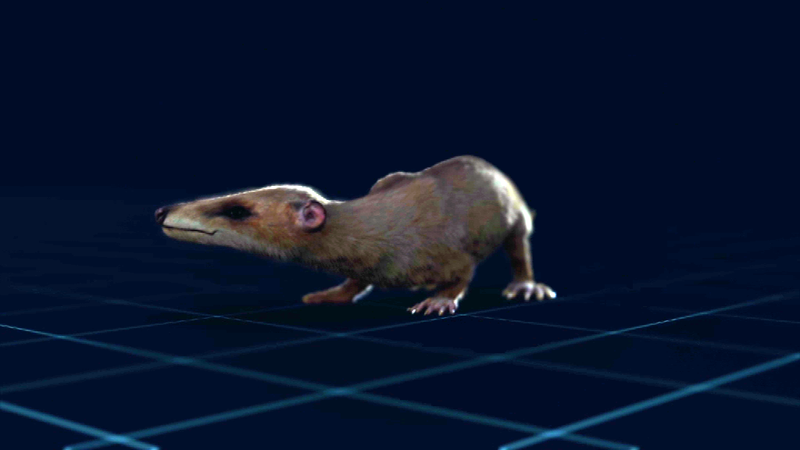 Artist impression of Castorocauda lutrasimilis (Courtesy Mark A. Klinger/CMNH). The existence of this animal living in the watery environment has pushed back "the mammalian conquest of the waters by more than 100 million years" according to Dr Thomas Martin, an authority on early mammals at the Senckenberg Research Institute in Frankfurt, Germany. In May 2005, palaeontologists in Utah, USA, claim they have found the missing link in a new species of dinosaur with feathers showing that around 125 million years ago some meat-eating reptiles slowly evolved into plant-eating types. The new feathered dinosaur species supporting this claim is called Falcarius utahensis. It literally means "sickle maker from Utah". Standing not much taller than 1 metre and roughly 5 metres in length from head to tail, the near complete remains of Falcarius showed it had 10 cm long claws like sickles as commonly found in meat eaters. However the crucial link to herbivores was in the numerous small teeth lining its jaw. Instead of large, sharp pointy teeth to cut meat, the creatures entire teeth structure were more delicate and smaller to handle softer plant materials. The possibility exists that this species, despite its sinister-looking carnivorous appearance, may have exclusively feasted on plants and nothing else. But no one knows for sure. "It's the strangest looking dinosaur you can imagine. Could the evolutionary progression to plant-eaters (and of the feathers) be an indication that some animals were living in cooler areas frequented by fewer predators away from the oversized daily reptilian bloodbaths taking place in the hotter areas of the planet? Like a giant genetic experiment gone wild, another feathered dinosaur had four wings and another creature could do more than glide from one tree to another  it could flap its wings. A wealth of interesting fossils are now starting to emerge from China. "Five eggs are three-dimensionally pre­served, and some are really complete. It was most exciting to find many male and female pterosaurs and their eggs pre­served together." 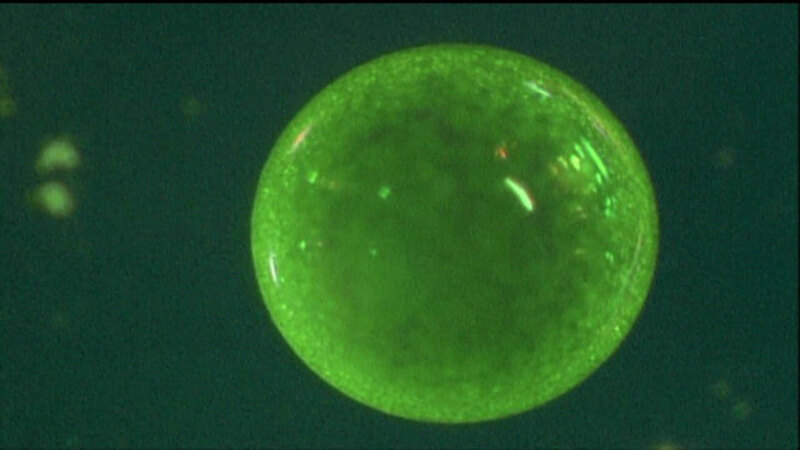 Scientists have observed how the eggs had a pliable and thin shell on the outside and a soft, thick membrane inside, reminiscent of those found in snakes today. 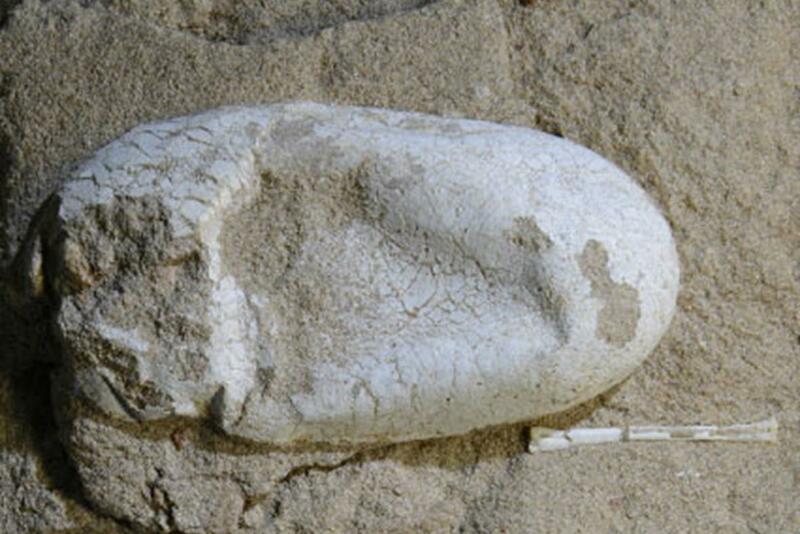 The eggs appeared to have been buried in sandy areas along the edge of an ancient lake mainly for protection from most predators, but also to provide enough moisture to prevent the eggs from drying out. As the eggs were developing and for a short period after the offsprings emerged from the eggs, either the female or male (or perhaps both) parents would come down to regulate the temperature in the sand during the day and to provide some further physical protection to the youngsters from the many small marauding predators roaming the area, especially from the forest nearby, and at night the parents would simply come down and rest on the ground as a large colony. Unfortunately, during a particularly brutal storm that swept over the area about 120 million years ago, it seems a number of these dinosaurs had died. And with no protection from the hot sun the following day, the young animals inside the eggs died as well. Looking at the well-preserved and complete fossils of the parents and their numbers (so far dozens have been uncovered and more are expected), scientists have been able to provide some remarkable details into the life, gender and general appearance of these somewhat gregarious creatures. What we do know so far is that these dinosaurs loved to stay together in colonies near the shore of a large prehistoric lake. Depending on their age, the wingspan varied between 12 centimetres (for the youngsters) to 25 metres (for the parents) from tip-to-tip, or roughly the length of a tennis court would pretty much give a good indication of the maximum length when the wings are stretched out. There are also clearly distinguishing features between the genders with the male possessing a noticeable and potentially colourful head crest. "Sites like the one re­ported here pro­vide further evidence regarding the behaviour and biology of this amazing group of flying rep­tiles that has no parallel in modern time." So expect more information to come about these interesting creatures very soon. The fossilised skeletons and eggs were first unearthed in 2005 in the Turpan-Hami Basin, south of the Tian Shan Mountains in Xinjiang, north­west­ of China. The planet Mars may have had conditions more favourable to the Earth at this time that we see today. Of course, whether life actually existed on Mars is still a matter of debate. Nevertheless it is believed that around 115 million years ago, conditions on the small planet started to change drastically. Mars is the fourth planet in distance from the Sun. It orbits the Sun in a rather unusual elliptical path  as if something may have collided with Mars a long time ago  such that it approaches Earth at its closest every 2 years and 2 months, reaching a point which is half as far away as it is at the farthest position. We also know that this orange-red world rotates about its own inclined axis of 24.935º in 24 hours 37 minutes 23 seconds and has seasons similar to those on Earth except they are much longer due to the extended Martian year of 687.8 Earth days. More interestingly is the atmosphere. Since Mars is a small planet, it has a low gravitational field. However, this is not the fundamental reason for the Martian atmosphere being feeble today with a pressure of only one-hundredth that on the Earth's surface. An analysis of the concentrations of certain types of isotopes of carbon, oxygen and nitrogen in the atmosphere suggest molecular nitrogen was in much greater quantities in the past than they are presently. This discovery has raised speculation that Mars may have once had a denser atmosphere consisting of mostly carbon dioxide, nitrogen and water, and the climate may have been warmer and wetter. Today, scientists are confident the atmosphere was much more humid, warmer and denser in the past. The reason for the atmospheric chemical changes and loss in density is still not yet fully understood. But the best explanation so far is that a large asteroid collided with Mars where it penetrated deeply enough and at an angle to reduce the speed of the iron molten core of the planet. Suddenly the magnetic field to protect the planet from the energetic solar wind was suddenly weakened, resulting in the solar wind pushing away enough of the atmospheric gases to reduce the density. Finally the change in the chemical structure of the atmosphere was caused by the emissions of carbon dioxide and other gases from its interior through volcanic activity. If this is so, then Olympus Mons, a tremendously oversized Martian volcano and its other close neighbouring volcanoes on the Martian equator, may well be the remains of such a catastrophic event. Olympus Mons. Image courtesy of NASA/MOLA Science Team / O. de Goursac, Adrian Lark. 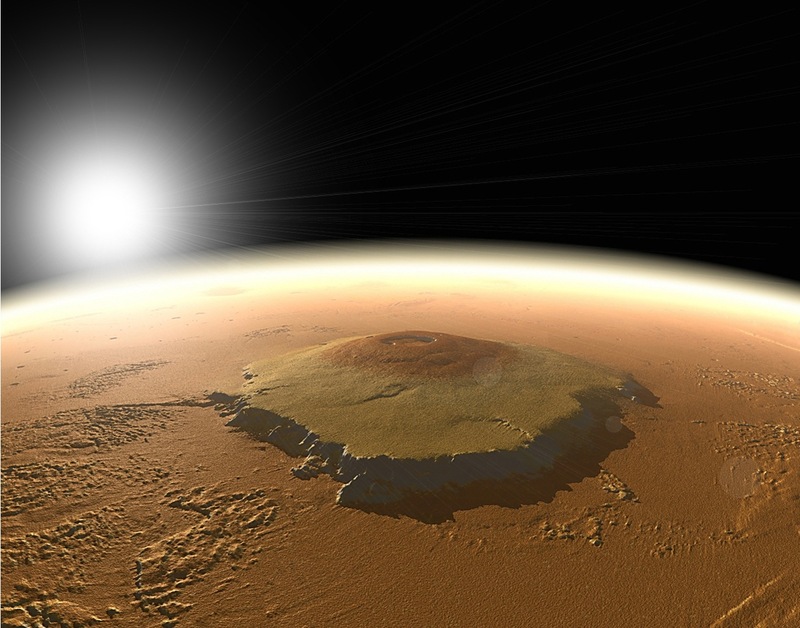 So far, scientists are placing the origins of Olympus Mons at around 115 million years ago. But the precise date is difficult to determine as the great volcanic mountain has, as recently as 2 million years ago, being spewing lava thus making it difficult for scientists to calculate the number of craters that have hit this region of the planet at the present time. Otherwise if this was not a collision of any sort, then one must be inclined to follow the recommended timeline as published in the journal of Science dated 21 April 2006 for how Mars has changed. According to the article published in the journal, an international team of scientists headed by Jean-Pierre Bibring of France's Institute for Space Astrophysics claim if Mars was hospitable at some point in its history, it would have occurred not long after the planet's formation nearly 4.6 billion years ago. Another 600 million years later, a second era began whereby volcanic activity become the dominating feature of the planet. This is the period where it is believed that the volcanic sulfur began to dry up the environment. The third and final era is marked by the formation of ferric oxides (the reddish material we see on the surface of Mars) not created or altered by water. "We have not visited the polar regions. I have always believed that in the search for life you must go where the water is. The permanent polar caps of Mars are frozen water and would act as a splendid "cold finger" to trap organic molecules. Who knows what those lucky future explorers of Mars will find there?" In religious and psychological terms, we call this searching for love and balance, or ultimately the gaining of sufficient experience and knowledge to help a living thing to understand what it kind of means to be the one true God of the universe (if such a thing actually exists). As one religious leader said, "Is it not written in your scriptures that you are gods?" By making the distinction between "gods" and "God" it shows that we are imperfect creatures seeking a more perfect "balanced" existence to escape the suffering and pain we all have to go through throughout the long road of evolution and in life in general. While creatures have suffered in the past and have found a way to survive better and genetically adapt more efficiently and effectively as their best solution to a given problem, every living creature is actually searching for the love that would see them have what they need to live for as long as possible in the universe. To transcend beyond our survival needs to one of being happy and able to apply our minds to broader issues is truly the definition of freedom. It is the ultimate form of balance and love. As human beings, we must be more creative in what we do and to try different ways of doing things in order to survive more easily and in many different types of environments. Not only because we can't be expected to stay on this planet forever (the Earth will be destroyed in 5 billion years from now, if not sooner should a big enough asteroid come along to wipe out life on this planet), but also because all living creatures deserve the right to experience this universe in peace and love and so ultimately understand the purpose for their existence as humans do today, and whether God actually exists. To survive these dangerous dinosaurs would have required sufficient intelligence in the mammals to overcome their initial and instinctive fear to run away. Part of the development in intelligence would have involved learning how to camouflage and/or hide themselves in the plant world or (heaven forbid!) in some of the huge waste piles left behind by the great dinosaurs for a long enough period of time so that hopefully the short-term memory of the predators would get them to forget about the prey. Otherwise, they had to adapt to the cooler conditions where dinosaurs were smaller in size and less prolific in numbers. Most of the crude oil we extract underneath the ground and process to make the petrol and oils for running our 20th and early 21st century motor vehicles originally came from the great plant life (and some dead prehistoric animals) that existed during this era. At first the supergreenhouse effect over the great supercontinents created a prehistoric environment of high humidity and heat needed to produce heavy rainfall over the land masses. As the rains fell from the heavens, many great Amazonian-like rivers swelled in volume, carrying with it a flood of nutrients consisting of nitrates and phosphates from animal waste and decaying plant life until the waters reached the seas and oceans of Tethys. But this wasn't a local phenomena. 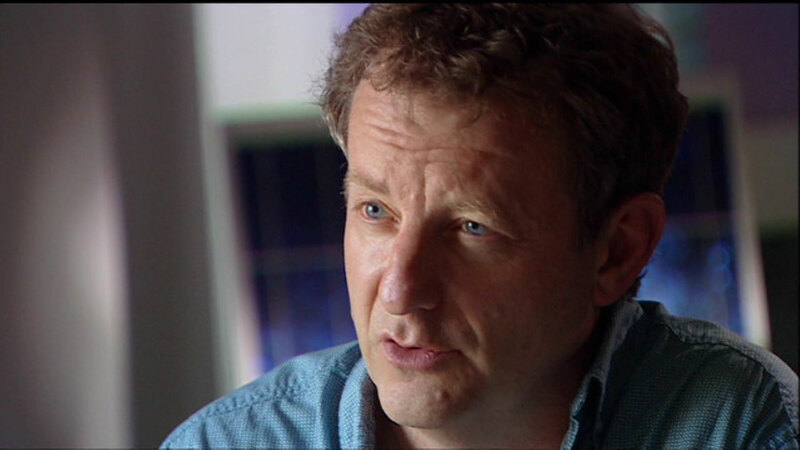 Evidence gathered by Professor Hugh Jenkyns of Oxford University showed the events of nutrient-rich waters reaching the seas occurred in what is now the Pacific ocean. In fact the entire oceans of the world was awash in this nutrient-rich waters. 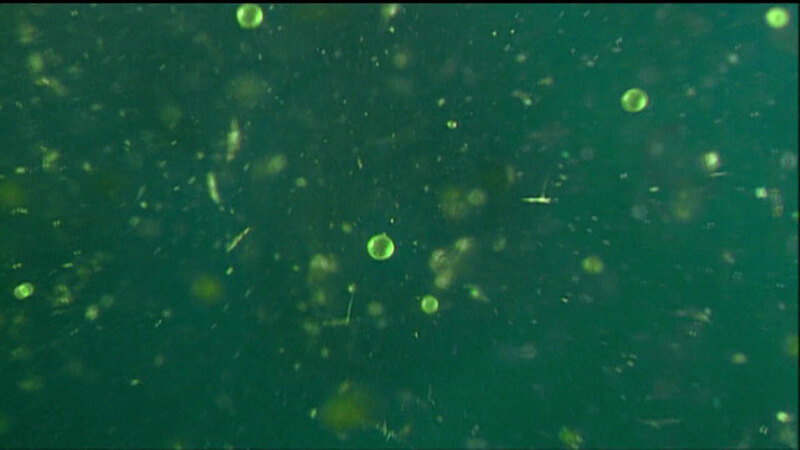 Here, the nutrients combined with carbon dioxide dissolved in the water from the hot tropical air and the sunlight penetrating the waters, fed the trillions upon trillions of tiny plant organisms known as photoplanktons and microscopic animals called bacteria. Examples of photoplankton today as it would have appeared in the shallow seas of 160 million years ago. Source: Smith, Dr Richard. Crude  The incredible journey of oil: Catalyst. 18 May 2007 (televised 24 May 2007). Millions of years would pass as these tiny creatures lived out their lives near the surface of the seas and oceans feeding on the great fertiliser that is Jurassic park over the great supercontinent and they were multiplying in vast numbers. At the mouths of great rivers one can see the massive areas of green plant life in the shallow seas and much of the oceans as it absorbed the nutrients. 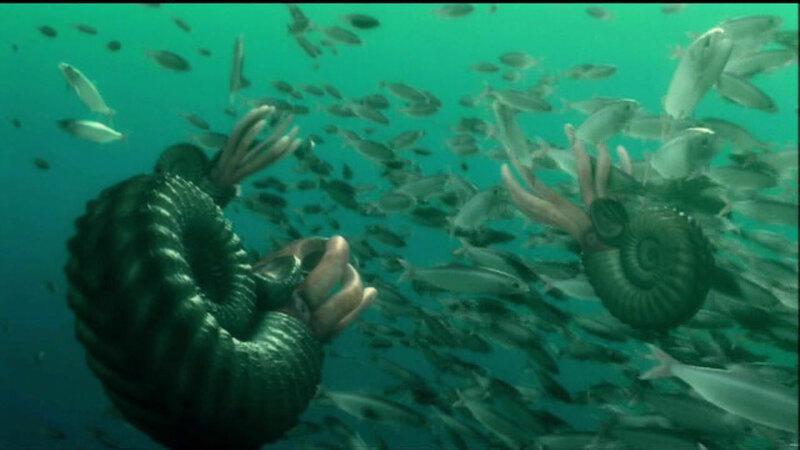 Together with other sea-faring creatures such as fish and prehistoric reptiles, the death of these creatures would see the organic matter drift to the bottom of the ocean. Layers upon layers of this organic matter built up over time. When combined with an almost zero flow of water over the shallow seas, we see one other factor favouring the formation of oil. Water deep down become oxygen deprived. Also the organic matter on the floor fed a entirely different type of bacteria not requiring oxygen to survive. This bacteria emitted as a waste product hydrogen sulphide  a toxic substance to animals and plants. Any life that existed in these stagnant shallow seas had to remain near the surface to get its food and oxygen, or moved to other parts of the world. Some of the ancient fish and other animals swimming and eating the photoplankton and each other in the prehistoric oceans of 160 million years ago. Source: Smith, Dr Richard. Crude  The incredible journey of oil: Catalyst. 18 May 2007 (televised 24 May 2007). Over the next 100 million years, the carbon-rich layers of sticky black mud became compressed. As the seas receded, the layers dried up into a black rock-like shale and later pushed deeper into the Earth where it can be cooked by the Earth's magma at the right temperatures and pressures to eventually form a thick black crude liquid known as oil, or black gold in today's commercial world. 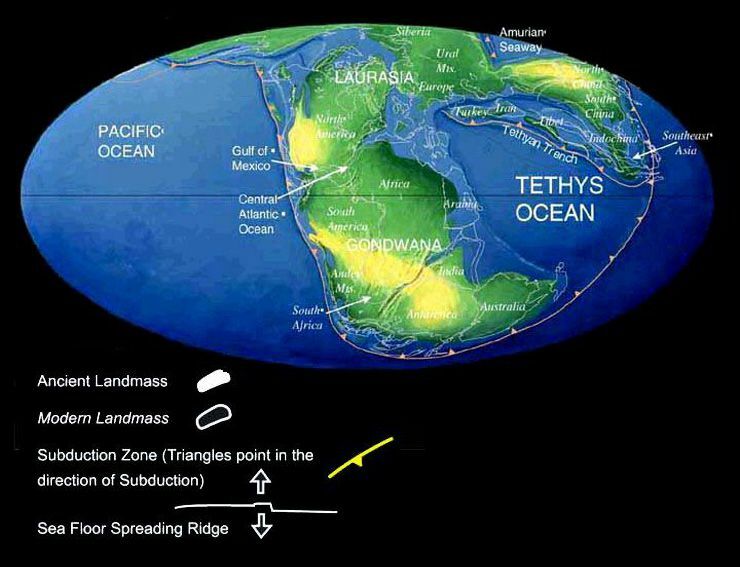 Around 160 million years ago, Saudi Arabia was part of the great shallow seas of the Tethys-Ocean. Today, Saudi Arabia has become a desert. And below this country lies the world's biggest deposit of crude oil measuring approximately 35 kilometres wide and 175 kilometres long. Nearly two-thirds of the world's oil supplies can be found in Saudi Arabia. As of 2007, humans are fast using up this oil reserve, and with it a release of extra carbon dioxide into the atmosphere. While other countries have gone past the oil peak and are facing the end of oil production (the US own oil supplies will run out by 2050 after reaching peak oil in the 1970s), it is only now (i.e. 2006) that Saudi Arabia has past its own oil peak. The end of the oil age has truly begun. Should humans continue the trend in burning the oil in such great quantities, soon the carbon dioxide in the oil will be released in sufficient numbers to create a new supergreenhouse effect, far warmer than the greenhouse conditions we are experiencing today. However, this time, humans will not benefit from the plant life on land to provide shade, retain moisture on the ground, and grow adequate food supplies. The new supergreenhouse effect of the future will bring extremely hot and dry conditions to most parts of the world. Where there is rainfall and vegetation left is likely to be turned into the final fringes for growing food. Should we destroy even those moist and green areas due to poor environmental practices, humans will face economic collapse, and potentially the extinction of the human race.